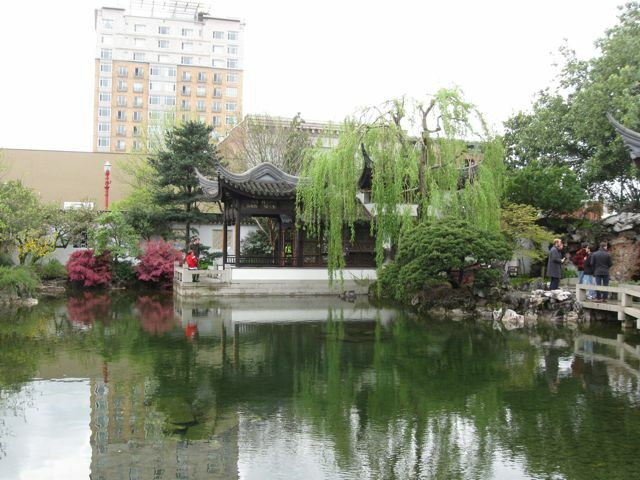 After the hectic days around Christmas and New Years, it is hard to shift gears to think to check for plum blossoms at the Lan Su Chinese Garden. Usually I am too late. This year, at the same time of month, I appear to have been too early. Other flowers were in bloom though. (I’m posting these for all the people buried in snow–spring will come.) Mostly, though, moss was the feature–that is a Pacific Northwest winter, rain and moss. We haven’t had s much rain as usual, but enough to make moss. It was a rainy day, and I went on purpose to hear the drip from the tile roof, but it was a misty rain while I was there, so I still haven’t heard the featured sound. Someday. That was last week. This week I tried again. Still not full bloom. (I don’t think this is the tail end–looked like buds waiting to open to me.) Meanwhile, decorations for Chinese New Year have begun. Here are some more lanterns. It was a great day for reflections. In the foreground might be rosebuds. At any rate, there were no roses in bloom either of these visits, though I did see buds. These are the first visits I remember that there was not even a single rose. Still there is always much to see, no matter the season or weather. I’ve visited several times since renewing my Lan Su membership, but for one reason or another didn’t take many photos. Last week I was camera happy. First some overviews–it has been so long that I’ve forgotten names of some of the building. I do remember the land boat (left), but not the pagoda’s name. And the zigzag bridge–shaped because evil spirits go in straight lines, thus they can’t get across. I was amazed at how much green remains in the garden. It has been a mild fall. On my street there are bare trees that had been yellow, red leaves still hanging and a few green trees delaying the color thing. The poetry wheel is either new, or I’ve managed to visit at times when it wasn’t displayed. Workshops were taught–I’m not sure how many styles of poem were among the lessons. The form the garden sports is the couplet: two lines with patterned opposites. If the first word of one line is “many” the first line of the next is “one,” for example. 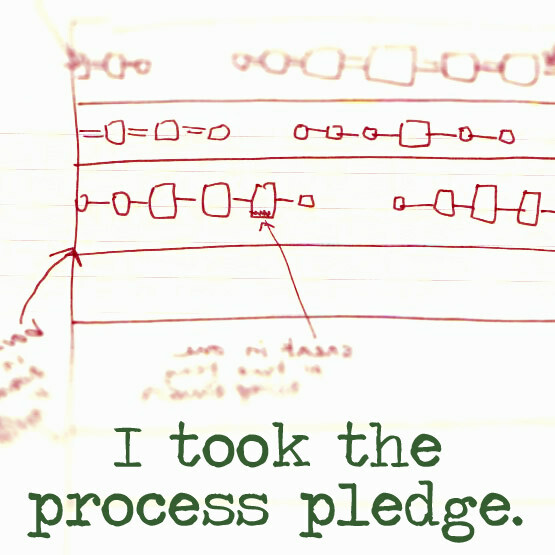 The poems I read did not follow that pattern. Workshop attendees could opt to exhibit their poems. I took some close ups to share, but the words weren’t visible in the photos. You’ll have to use your imagination. The sun was bright and beautiful, but it did wash out color on some of my photos. On the other hand, it made shadow designs. There actually were quite a few people visiting that day–and they did photo bomb some of my shots. It seems amazing I got any without people. And pomegranates in two places, a large tree and a potted tree. The tour guide said the ones on the small tree were the largest he had seen it produce. It seems a plentiful year. In the past there has been fruit still hanging late into winter, so I guess they don’t harvest them. And in spite of it being fall, there are still flowers. I hope you enjoyed your vicarious visit. It’s been a couple years since I last visited the Chinese Garden. Out of town guests prompted me to renew my membership. As is my usual custom, we did the tour (I always learn something new) and sipped tea in the tea room. I’ve always appreciated the carved panels. 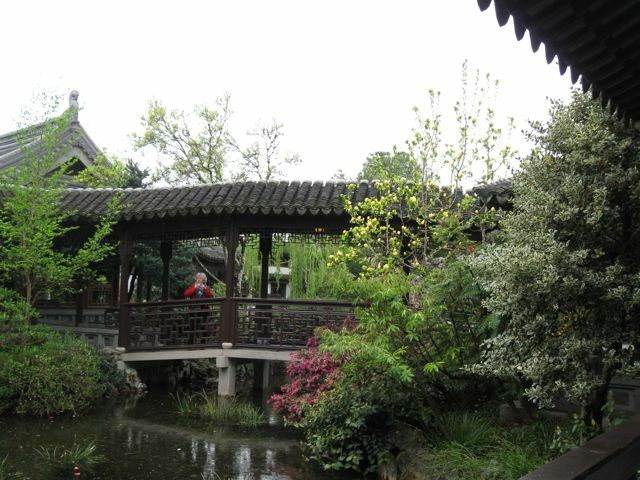 Previous guides have mentioned that each of the four represented historic philosophers’ gardens in China. 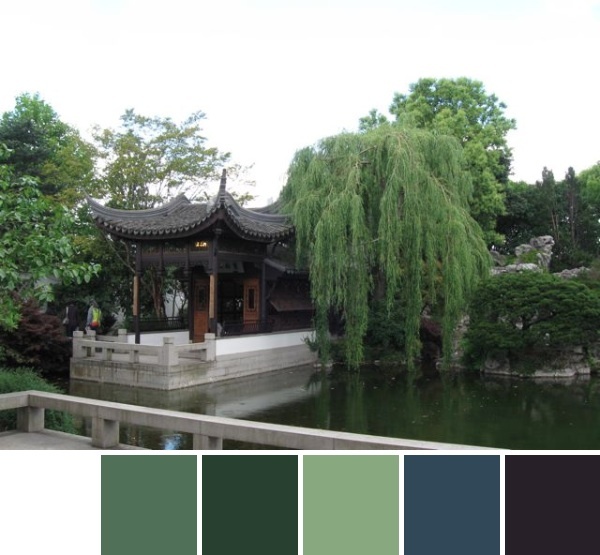 This guide pointed out that this panel showed the garden that the design of Lan Su was mostly based upon, noting the tea room (top), pagoda, and zigzag bridge. And here is the bridge in the garden. Previously I’d heard the lore that the zigzag made it more difficult for evil spirits to cross; this time the explanation was more mundane. It delayed passage, slowing people down, giving the experience of a larger garden. For a real philosopher’s garden would also be a small space in a busy city, made to look/represent large. As in the “mountain” and waterfall. Sometimes the idea is all that is needed. Then to the tea room. This time we were seated upstairs where we got an overview of the garden. Each kind of tea has its own kind of pot and cup. I especially liked this delicate flowerlike cup for the Black tea with rose petals (timely because of the rose parade). Here is the Lan Su float for the rose parade. Yes, I was a wimp and viewed from inside on a chair! But floats were on the street later for close-up looks. I have more float photos; maybe another day. 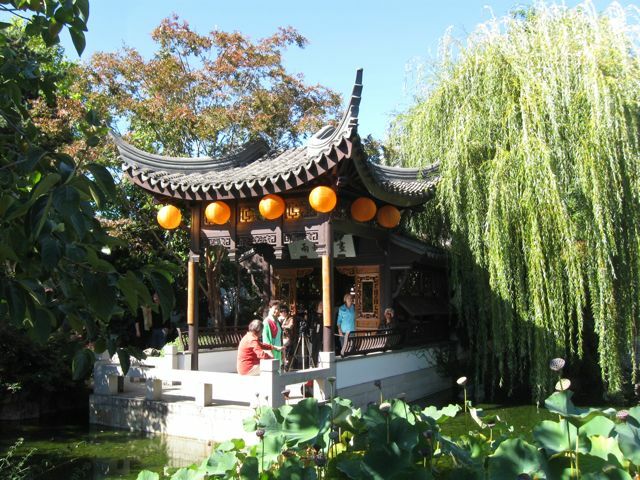 The Lan Su Chinese Garden is closing after Thanksgiving for some major repairs to the lake–the lining needs to be replaced and they are creating places for the koi to hide from the herons that pass through for dinner. That pushed me to make a visit before it closed, and the timing led to some spectacular color. With that little penjing as an accent. I remember the first time I saw one of those miniaturized trees changing with the season. After my surprise, I thought, Of course! There were other more delicate colors, as well as an exhibit of mums and floral arrangements. And the most persimmons I’ve seen on the tree. Maybe I should say the most I remember seeing–I didn’t go back and check old photos. There were indoor floral arrangement demonstrations too, and we watched two. But my photos of their arrangements didn’t turn out. Two very different styles, and fun to see both. And mums everywhere. 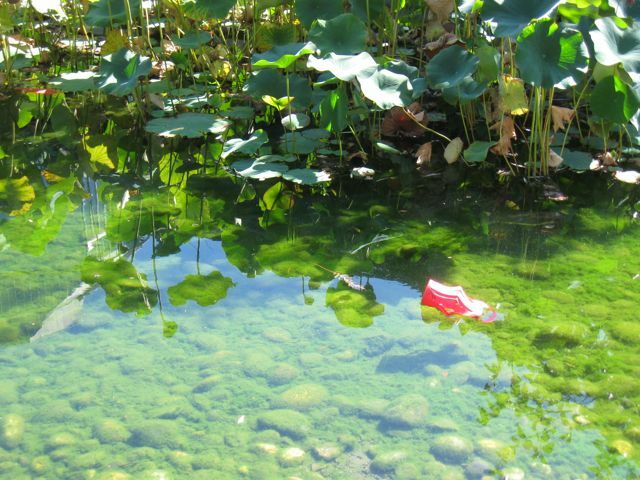 And the ritual landboat shot–with persimmons to the left and lotus in the foreground. The view through the keyhole arch was spectacular too. This weekend is the Mid-Autumn Festival, second in popularity to the Chinese New Year. 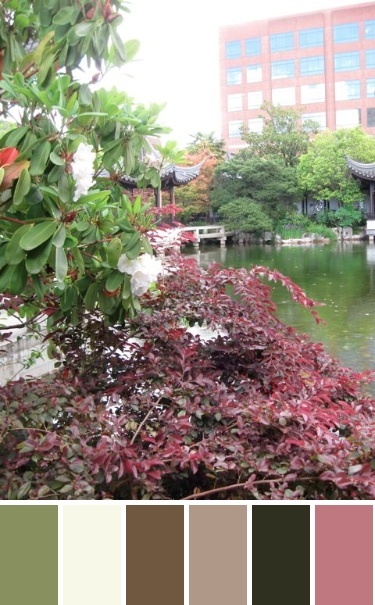 Lan Su Chinese Garden celebrates both in a big way. I made it to two performances and enjoyed a moon cake, traditional pastry of the festival. I got there in time for the Lion Dance, but not in time to get a good viewing spot. Too bad I didn’t remember how to do videos–the batting eyelashes and scratching behind the ear would have been fun to capture. That the lion was maneuvered by people did not have to be hidden, as you can see from the photo where the lions raise their heads. The lion definitely liked its reflection. That pose plus some stair climbing animal tricks were amazing when you think the performers’ hands were busy manipulating head and tail, so all other motions were made feet alone. My ritual photo of the land boat. This photo is from the stage. The land boat was prime viewing space, so as soon as the Lion Dance was over I headed that way. The performances were every hour on the hour with time to enjoy the garden in between One activity for children was making red lanterns. One didn’t make it home. I spent the 15 minutes between acts holding my spot for viewing the next performance and watching fish along with the floating lantern. You may remember photos from a way back where a heron visited the garden. 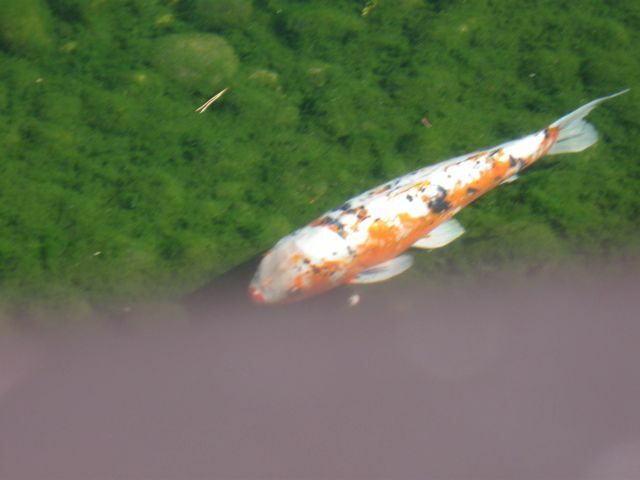 Seems they feast on the fish in the lake. I doubt they would eat this big guy though. The dancers performed three numbers. I did not get the name of the first one (blue costumes); the second was Golden Peacock, and the last was Lotus Dreams. Again, video would have been great to capture the gliding motion among others. The weather was perfect for enjoying the festival, and if the sky remains clear, I’ll enjoy the eclipse tonight. Lately I’ve been seeing posts deriving palettes from photos through various programs, Palette Builder 2.1 being one of them. I decided to play too. 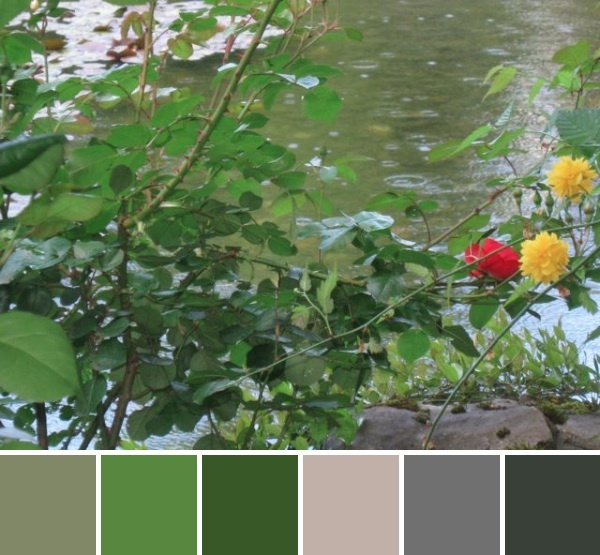 While I might have fun playing with this palette, the first thing I notice is what is missing, the reds and yellows. Does that mean Moda doesn’t have a match for these? I’d be surprised if that were true. Is it related to amounts of color, and the tool goes for larger percentages? Maybe. Let’s try another with more accent colors. Where are the white and reds? Does the algorithm “assume” that I can see these accent colors for myself and need help only with the more subtle ones? Maybe. Well, let’s try one where there is no accent color, just for fun. 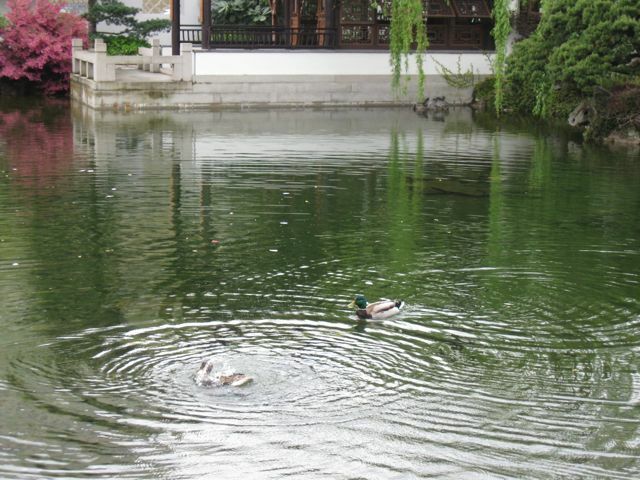 This one is to say, yes, these are from my most recent Lan Su Chinese Garden visit. And yes the red rose is blooming again. And here is the ritual landboat shot. I missed the new ritual bridge shot. Gotta get into that habit. But about color: no accents to lose, so no disappointment. Benefit of the palette builder here is the blue, second from the right. I’d not seen that in the photo. Just one more. It is a bit addictive, I must admit. I tried a more colorful photo. Can you believe that that one pink (I’ve already forgotten its Moda Bella name) is the only reddish color from that photo? It is obviously not a selection based on amount of a color in the photo. [ETA: Since looking at the tutorial mentioned in the comments, I see that the program does work from volume of a color. I’ll have to study why that doesn’t appear to be the largest amount of a shade of pink to my eye.] I would also appreciate if the “save” feature produced the names of the Kona Bella solids along with the squares. You get the names when you upload the photo; they just don’t save. A while back I took a class with Jean Wells Keenan when she was inducted into the Quilters Hall of Fame. 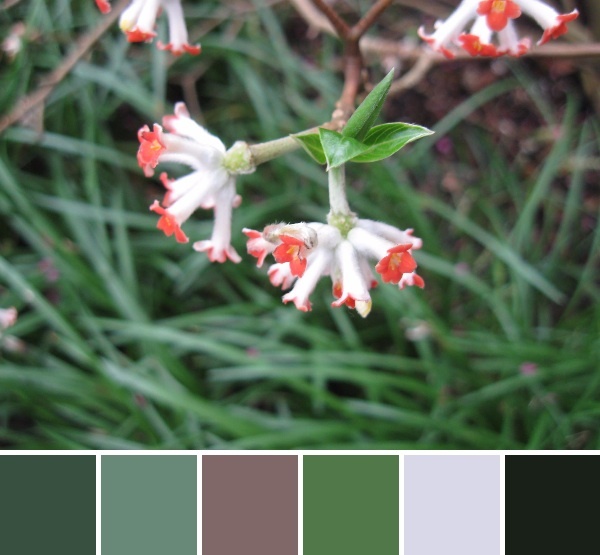 She too advises getting a color palette from photos. However, she emphasized maintaining the proportions of colors in the photo. Now wouldn’t a tool be lovely if it did that proportion math? Of course I’m using a free app; maybe one exists out there that does what I want for a fee. 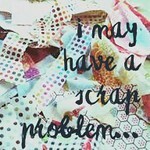 I’ll be linking with Creative Goodness on Friday, link in sidebar. I totally missed February at the Lan Su Chinese Garden, so I never did see the plum blossom tree in full bloom. Nor can I tell you if the red rose was still blooming. But I can tell you it wasn’t on March 25. Plenty of other flowers were, though. The landboat and the weeping willow. Wasn’t it nice of that tourist to wear red and pose there? If you can’t wait for tourists to move, it is nice when they fit the photo. The weeping willow looks so lacy in the spring–I think that is one reason I started making the landboat a ritual photo. This isn’t the usual angle for the landboar shot, but it was raining, so I stayed under a roof. As to wildlife, there were two mating pairs: scrub jays and ducks. The jays darted in and out, but were too fast for me to get a photo. They were looking for a nesting spot. After they nest, they will dive bomb visitors for a few weeks. I did get one of the ducks, though they weren’t into staying still either. I learned something new–it pays to do the tour each visit, each guide is so different. This one emphasized issues of education, occupation and status. It seems not just any child could inherit the garden; it had to go to one with the proper education and standing! So the wealthy families selected one son to groom for status and inheritance.